Here are some of the more interesting but smaller additions and refinements made to Apple’s mobile operating system throughout the beta testing period. Your location is sent to Apple before your battery dies – If you ever lose your iPhone, this new feature allows your iPhone (or iPad) to send its last known location to Apple when the battery drains to a critical level. iCloud holds this information for 24 hours, but this new setting will allow Apple to access location information for a lost device for a longer period of time. What song is playing? – Shazam is now integrated into Siri. If you ask Siri, “What song is playing?”, Siri will identify the song for you using Shazam. Scan your credit card in Safari to use it – In iOS 8’s web browser (Safari), you will be provided with the option to scan in credit card numbers when making online purchases, instead of manually entering it. 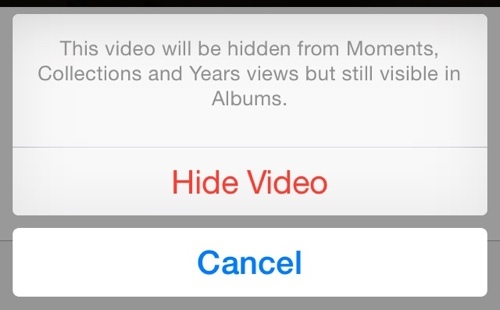 Hide images from Photos app – Images and videos in the Photos app can now be hidden from the Moments, Collections, and Years view in the Photos app. Holding your finger on a photo will bring up an options menu and selecting “Hide” will keep it from being visible in those sections. Hidden photos are still visible in the albums view, however, in a new “Hidden” album. Phone calls over Wi-Fi – iOS 8 now has WiFi calling, allowing you to place phone calls over WiFi when connected to a WiFi network, which is handy when your carrier signal is low. Several carriers, including T-Mobile, have already announced support for the feature. Find which app is draining your battery life – iOS 8 includes a new Settings option that allows you to view battery usage by app. If you go to: Settings > General > Usage > Battery usage you will be able to view a list of apps and their respective battery usage. 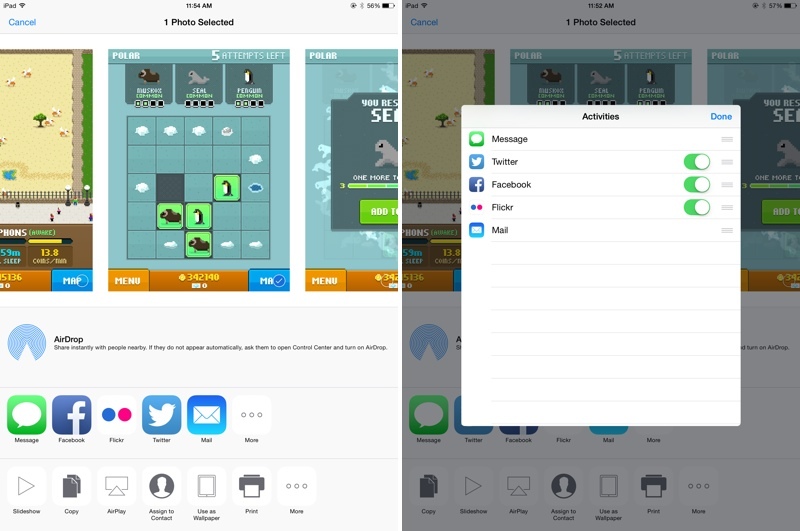 Get Tips on Using iOS 8 (beta 4) – iOS beta 4 brought a new Tips app, which was first hinted at during WWDC. 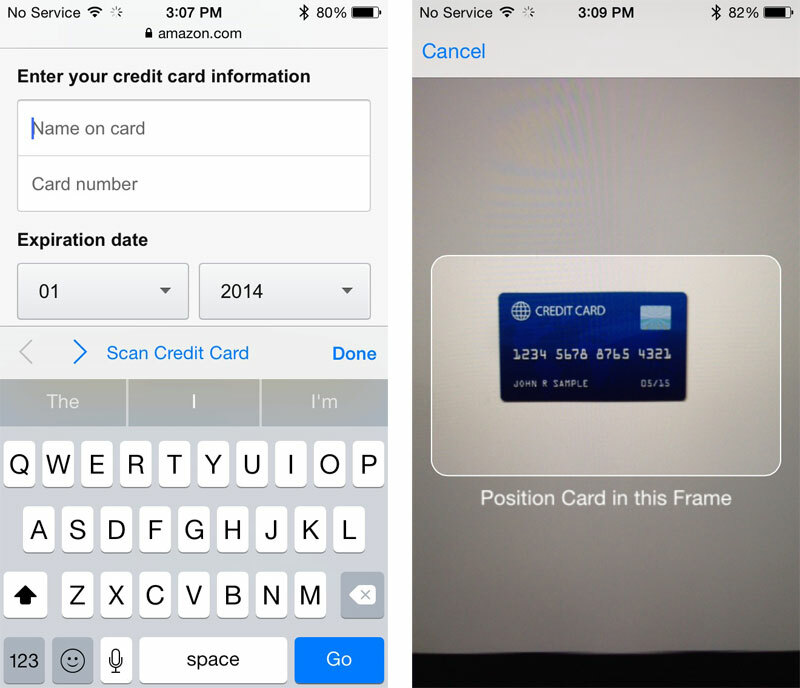 The Tips app offers iOS 8 users information about all of the new features in the operating system. Real Time Talk-To-Type – In iOS 8 beta 4, the Talk-to-Type option on the keyboard used in apps like Messages and Notes now displays spoken text in real time instead of waiting for an entire spoken line to be completed before displaying text. Faster voice recognition – Siri now displays what is being spoken on the iPhone or iPad display as it is said, allowing users to get immediate feedback on what the voice assistant is hearing. Voice activation – Saying “Hey Siri” while an iOS device is plugged in will activate Siri, allowing users to give hands-free commands. Download Apps via Siri – Users can now ask Siri to download an app from the App Store, which will initiate an App Store search. Currently Siri cannot open the App Store. New smart Photo Albums – The Photos app has received new organizational options, including two albums for “Recently Added” and “Recently Deleted.” The Recently Deleted section temporarily displays images that have been removed from the app in case of accidental deletion and a timer was added to display the amount of time remaining before a photo is deleted. Black and white smart adjustments – The smart editing tools in the Photos app were updated to add a section for black and white adjustments in iOS 8 beta 3, letting users choose from several black and white presets and adjust Intensity, Neutrals, Tone, and Grain for a customized look. iCloud Photo Library – It’s now possible to select a length of time when pausing iCloud Photo Library in the iCloud section of the Settings app. Last Updated – Photos now displays a “Last Updated” notification to let users know when images were last synced to iCloud. There’s also an iCloud Photo Settings option to store full resolution photos solely in iCloud while keeping device-optimized versions available on the iPhone to save storage space. Photo location (beta 5) – As of iOS 8 beta 5, the Photos app displays the location where a photo was taken above the photo itself. 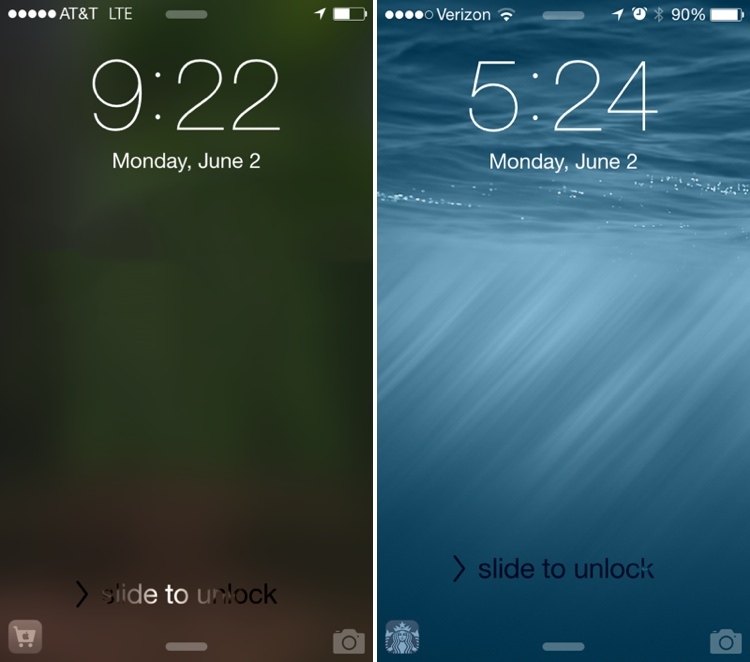 Photo below depicts photo bar before iOS 8 beta 5 was installed and after. Time-lapse photography – The Camera app has gained a new Time-Lapse mode, which captures a series of images and then compiles them into a time-lapse video. There are also new manual exposure controls, which allow exposure to be selected when taking a photo, and a self-timer mode that can be set for three or 10 seconds. Panoramic mode for iPad – Panoramas, previously only available on the iPhone, can now be captured with the iPad with a new Panorama mode in the Camera app on the iPad. Focus controls – iOS 8 separates focus and exposure, allowing users to swipe up or down on the focus box to change the exposure of photos when taking pictures on the iPhone or iPad. Timer mode – There’s a new timer function for photos that can be set for three or 10 seconds. Recover deleted photos – In the camera app, when the small preview icon at the bottom of the screen is tapped, it opens up a view that allows previously deleted photos to be recovered. A photo can be retrieved by tapping on the trash can (delete) icon. This menu can be cleared by emptying the new “Recently Deleted” album in the Photos app. 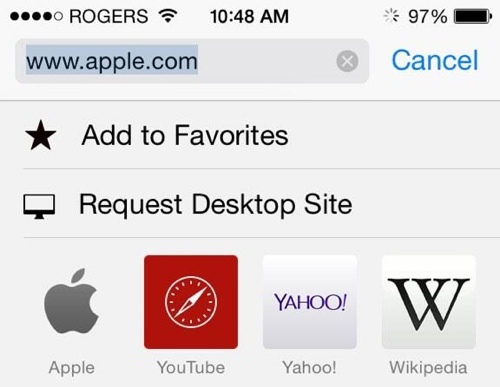 Request desktop site in Safari – Safari now includes an option to “Request Desktop Site,” which will load the desktop version of a site rather than the mobile version. More private search – Users can now opt to select DuckDuckGo as their default search option in Safari. DuckDuckGo is known for its anti-tracking stance, opting not to profile its users. RSS feeds – The Shared Links section in Safari now allows users to add RSS feed subscriptions. App Store ad blocking – According to the release notes, Safari will now block ads from automatically redirecting to the App Store without user interaction. Safari also includes a new pinch to tab view. Bookmarks icon (beta 4) – In beta 4, Apple slightly tweaked the look of the Bookmarks icon in Safari. Swipe to delete albums – It is now possible to delete albums from the music app with a left swipe. In iOS 7, it was not possible to delete an album. Left swipe delete also works in Songs and Artists. Add songs to Playlists from other Playlists – Users can now add songs to Playlists from already existing Playlists. In iOS 7, it was only possible to add content from the Songs, Artists, Albums, Composers, and Genre tabs. Automatically delete messages – Along with several improvements to group message management, there are now options to remove stored messages after a set period of time of 30 days or one year, which will allow users who have extensive iMessage threads to free up valuable space. 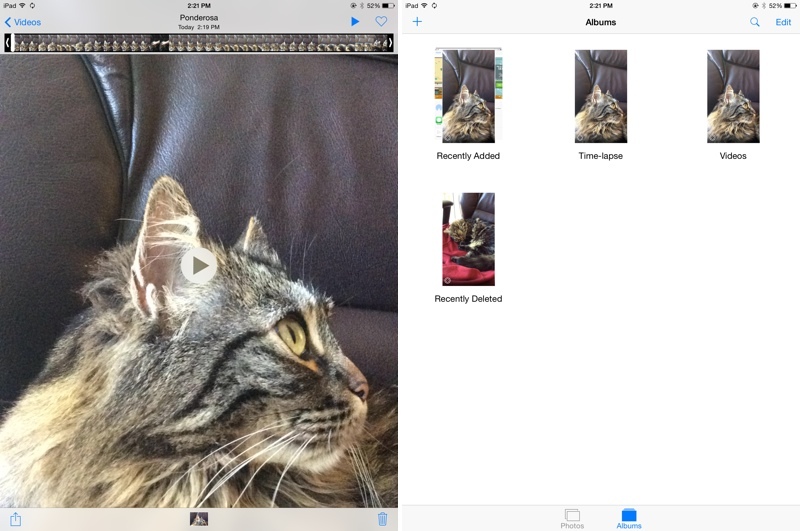 Storing photos and videos (beta 3) – iOS 8 beta 3 added a new option to automatically save the quick audio and video messages that were introduced with the new OS. Normally, these messages are deleted after a short period of time to save space. 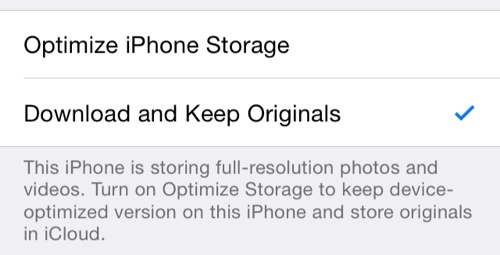 And in beta 4, photos and videos save settings were split into two separate options. Quick access to recent photos – When adding an image to a message, there’s a new feature that displays recent photos for quick insertion. Icons (beta 2) – Icons for the camera and the microphone in Messages are now gray rather than blue and there’s a new setting to mark all messages read. 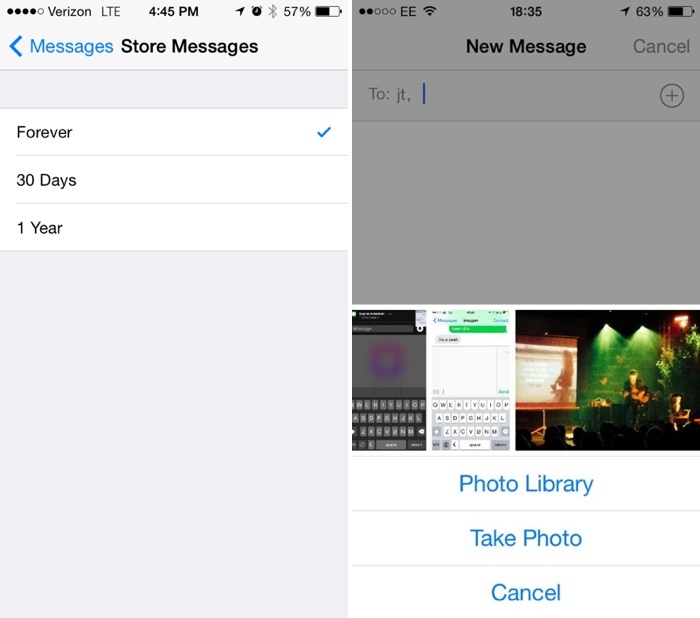 Batch save attachments – A new Details menu for contacts within Messages shows displays all of the photos and attachments that have been sent in a conversation. It’s possible to save/delete all images at once by holding down on a single image to bring up a “More” option that allows multiple attachments to be selected at once and saved or deleted. The Weather Channel – Apple is now using weather data from The Weather Channel instead of Yahoo. 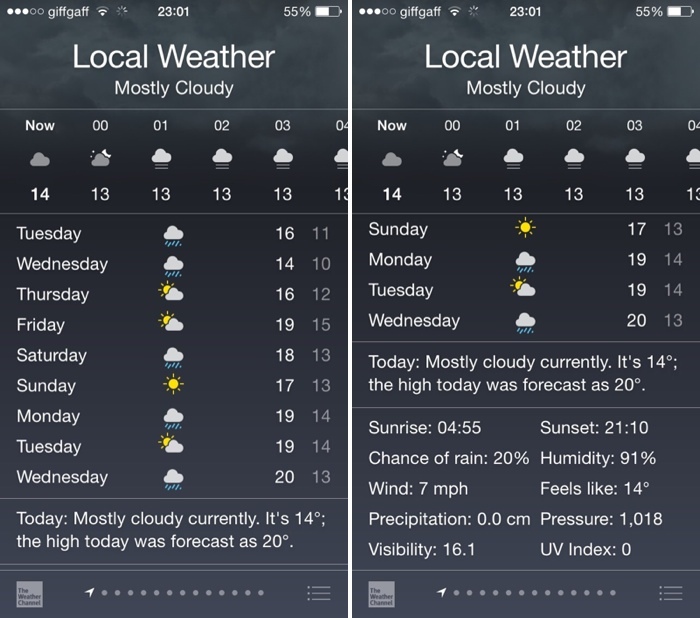 Longer forecast – The Weather app now displays a nine day weather forecast, up from the previous five day forecast. More weather information – There’s a new weather summary at the bottom of the Weather app, along with info on sunrise/sunset times, humidity, wind speed, visibility, UV index, pressure, and more. 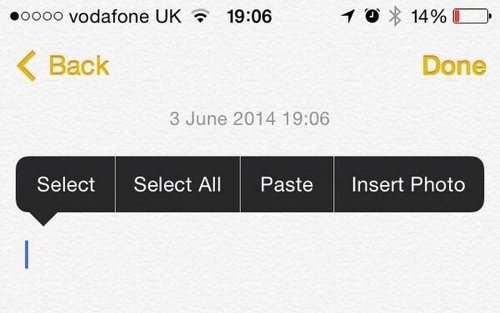 Add photos to Notes – Photos can be inserted into the Notes app from the Photos app for the first time in iOS 8. Notes has also gained rich text editing. iBooks Features – iBooks now comes preinstalled on iOS devices with iOS 8. Previously, it was a separate download in the App Store. There’s also a new auto night mode and an organization option to group books from a series together. Mail notifications per thread – Swiping left on an email message in the inbox of the Mail app will allow users to delete/archive it, flag it, or access a “More” tab that includes an option to receive a push notification whenever a reply is sent to that particular email thread. 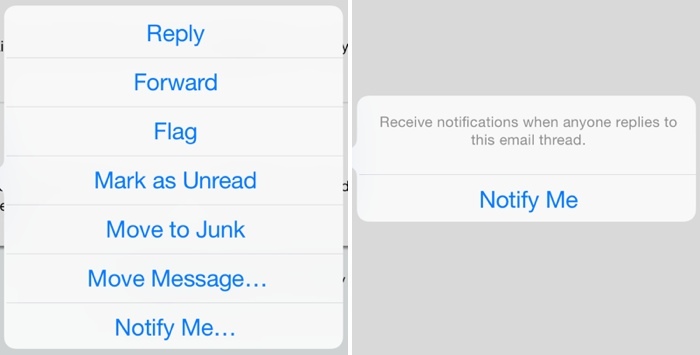 These new Mail gestures gained a setting that allows them to be changed in iOS 8 beta 4. Calendar – There are new options for alternate Calendars, including Chinese, Hebrew, and Islamic. There’s also an option to display week numbers. Calendar events can also be declined with a comment. FaceTime – FaceTime has a different look on the iPad, with the preview window now located on the right side of the screen instead of the left side, along with a new look for contacts. 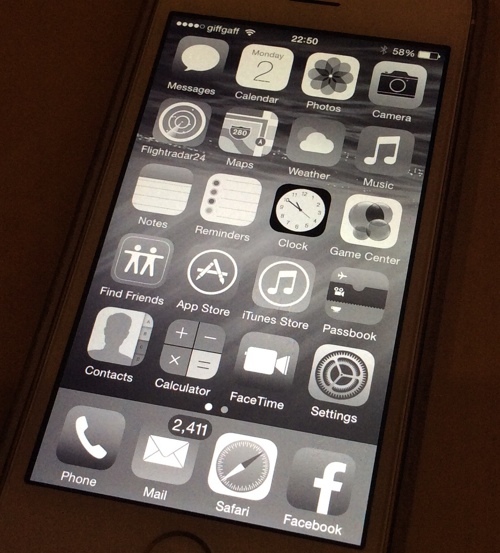 FaceTime on iPhone also has a new look, which does away with the Favorites, Recents, and Contacts bar on the bottom. Podcasts (beta 2) – Following iOS 8 beta 2, the Podcasts app is a default iOS app that comes pre-installed on iOS devices. This means it can no longer be deleted. Health – In iOS 8 beta 5, Apple’s Health app was updated to collect Spirometry data. Spirometry tests measure lung function, tracking the volume and flow of air when inhaling and exhaling. The app also gained several new icons, the ability to export Health data, and a “Show When Logged” option to display Medical ID on the lock screen. Privacy settings for Health were also added to the Settings app. Quick access to apps based on your location – The App Store in iOS 8 uses location to display apps on the lock screen at relevant locations. For example, when at the Apple Store, the Apple Store app is displayed on screen, and at a Starbucks, the Starbucks app is shown. Tapping the icon for an installed app will open it, while tapping an icon for an app that is not yet installed opens the App Store. 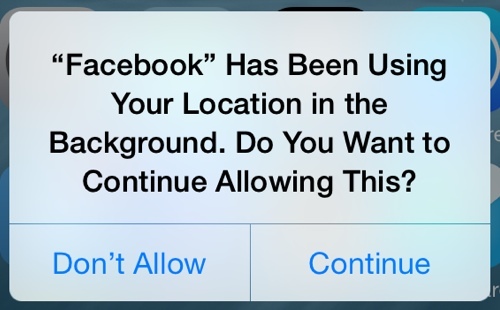 Background location usage App notifications – iOS 8 has new popups that will notify users of apps that access Location information while running in the background. The popup asks users if they want to continue to allow the apps to access the information or turn it off, giving users more information on apps that could potentially be using a lot of battery life. 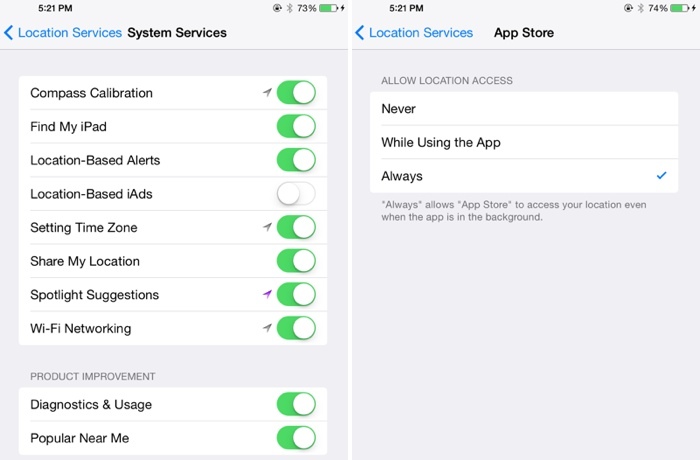 Choose when an app can use location data – There are new settings within Location Services that allow users to permit apps to access location information “Never,” “While Using the App,” or “Always.” Previously, location services in each app could only be toggled on or off. System services – There are new toggles for Find my iPad, Location-Based Alerts, Spotlight Suggestions, and Share My Location, all related to new features within iOS 8. Spotlight now includes location-based information like Movie times, while Share My Location allows location information to be inserted into Messages. 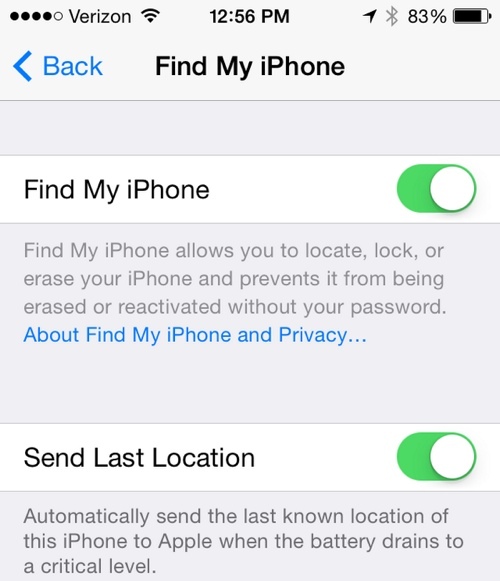 Combined, all of the new location settings offer far more control over privacy and location sharing in iOS 8. Easier access to notifications – In the Passcode settings, there are new toggles that allow users to access Today and Notifications View on the lock screen. Previously, these toggles were located within the Notifications settings. Control Center access on the lock screen is still controlled via the Control Center menu. 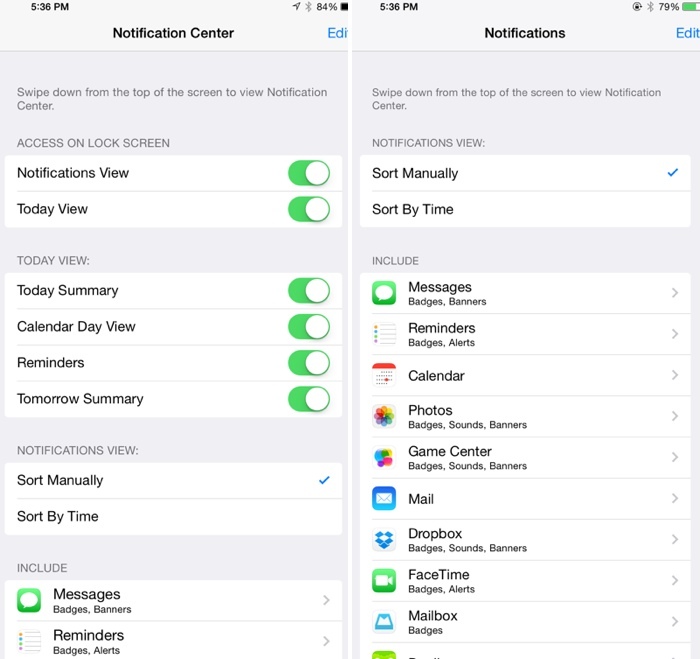 New Settings look – Several Notification Center settings have been moved elsewhere in the Settings menu, giving that section a more streamlined look. There are no longer options to disable Today Summary, Calendar Day View, Reminders, or Tomorrow Summary. Allow Notifications – There’s a new “Allow Notifications” setting available for each app, which works as a sort of global mute to let users to mute notifications from an app on an individual basis. Previously, there was only an option to disallow apps from showing notifications in Notification Center. Grayscale mode – There are several new Accessibility options, including a new “Grayscale” mode that shifts the entire operating system into shades of black and white. 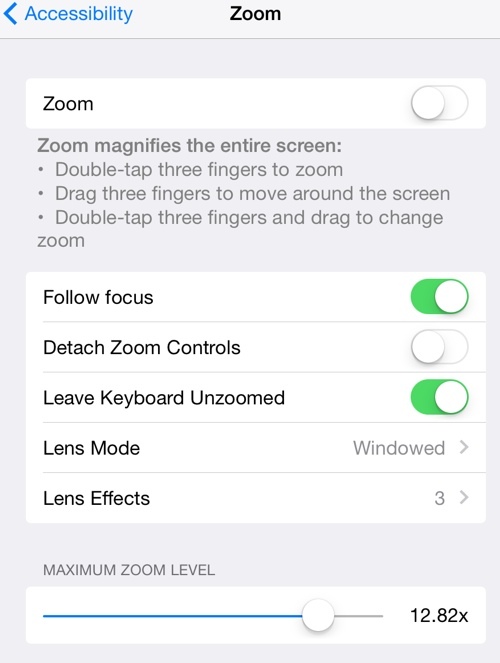 There’s also Improved Zoom option. 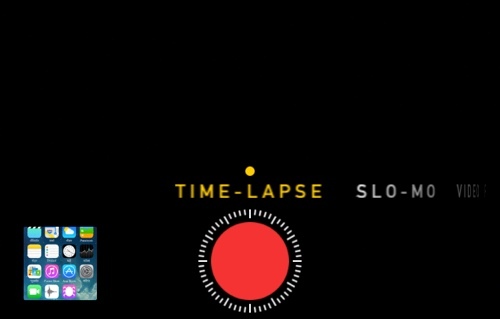 Improved zoom – There are quite a few new options within the Zoom menu, with new toggles for Follow focus, Detach Zoom Controls, and Leave Keyboard Unzoomed. There are also new options for Lens Mode (windowed and full screen) and Lens Effects (grayscale, grayscale inverted, and inverted). Speak Screen – A new option within the Speech section of Accessibility lets users choose to Speak Screen, a function that will speak the contents of the screen with a two finger swipe gesture. Hebrew speech output is also an option. Share sheet customizations – When sharing an image, website, or other type of media, users can now customize their sharing options. The list of apps where content can be shared can be rearranged and disabled, as can the media options like Copy, Print, and AirPlay. Some sheet icons also have a new look that eliminates the black border in iOS 7.
iOS to Mac screen capture – It is now possible to capture video from an iOS device directly on a Mac. A device running iOS 8 plugged into a Mac will show up as a camera, which can then have its screen recorded using QuickTime. iTunes Radio in Control Center – When playing a song on iTunes Radio, the Control Center will now offer a “Buy” button to give users a quick way to purchase a song. The sun icons for the brightness controls have also been tweaked and are now black rather than outlines. Control Center Redesign – iOS 8 introduced a redesign of the Control Center that removes the black borders around the icons and turns icons white when activated. 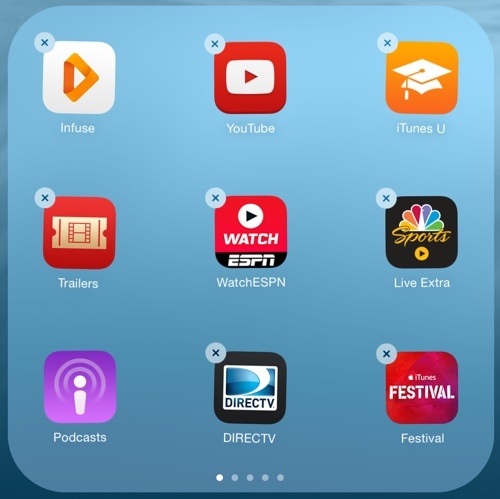 Peer-to-peer AirPlay – A new peer-to-peer AirPlay feature in iOS 8 will allow iOS devices to stream content to the Apple TV without the need for a shared network connection. 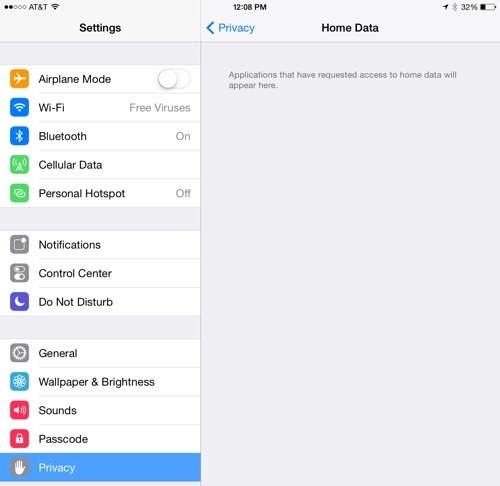 Privacy – There’s a new Home Data section within the Privacy menu of the Settings app. Keyboards – There are new Filipino, Marathi, Slovenian, and Urdu keyboards available. 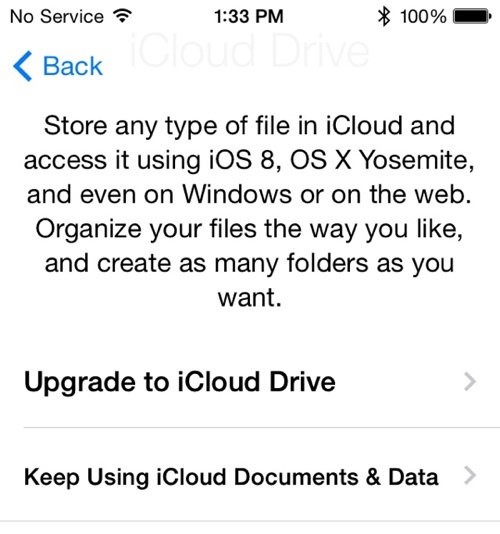 iCloud Drive – There’s a new popup window in beta 3 giving users the option to upgrade to iCloud Drive. Introduced at WWDC, iCloud Drive lets users store any type of file. There’s also a new section for iCloud Drive settings within the iCloud portion of the Settings app. Handoff – There’s a new Handoff setting in the General menu of the Settings app that allows users to toggle Handoff on and off. 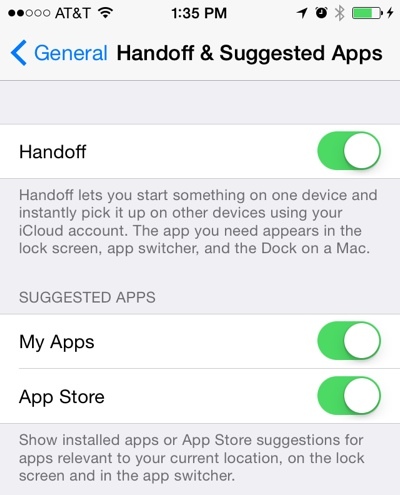 Handoff allows users to seamlessly transfer tasks between iOS and OS X. When a Handoff task or website is available, it is displayed in the App Switcher, accessed by double tapping the home button on the iPhone or iPad. Suggested Apps – The Handoff setting in the General menu was expanded to include Suggested Apps in beta 4, which are used to offer app suggestions relevant to location.This setting can be used to show only installed apps, or both installed apps and App Store apps. 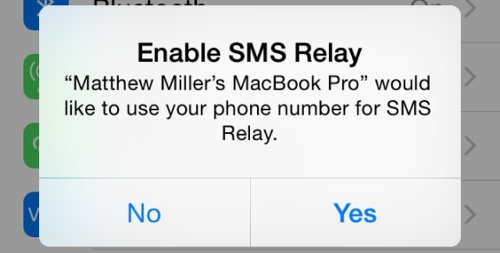 SMS Relay – In iOS 8 beta 5, users began getting a popup asking them to use their iPhones for SMS Relay on their MacBooks, one of the new Continuity features between OS X Yosemite and iOS 8. Display Settings – There’s a new Display & Brightness section that’s been unbundled from Wallpaper, with options to adjust screen brightness, text size, and activate bold text. In iOS 8, screen brightness controls were removed entirely from the Wallpaper section of the Settings app and moved solely to the Display Settings section. Contacts in App Switcher – Under the Mail, Contacts, and Calendars heading in the Settings app, there’s a new option to toggle off Favorites and Recents for Contacts within the App Switcher. Emoji keyboard icon – The icon for Emoji on the keyboard has been updated with a happier smiley face. 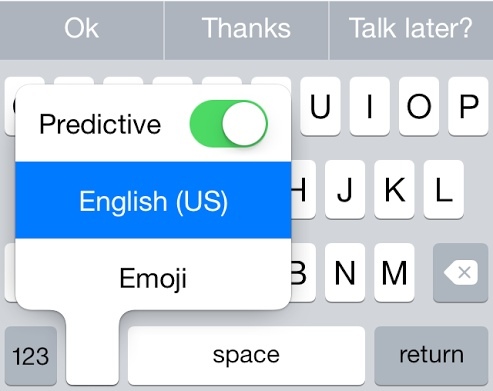 Predictive text – iOS 8 added a new option on the keyboard to toggle on predictive text, also known as QuickType. 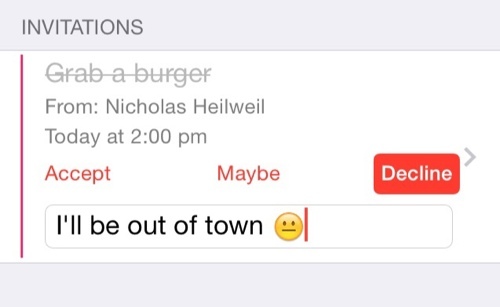 Apple began referring to QuickType as predictive text during the beta testing period. iOS 8 beta 5 also saw predictive type animations speed up somewhat. 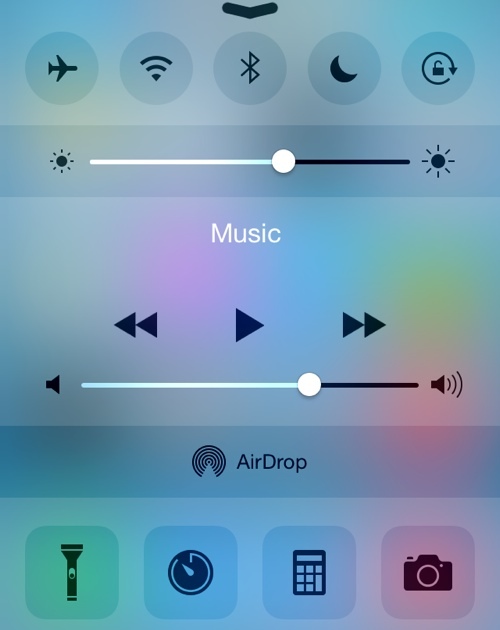 Spotlight Search speed – The animation for pulling down on the screen to access Spotlight Search is sped up in iOS 8.